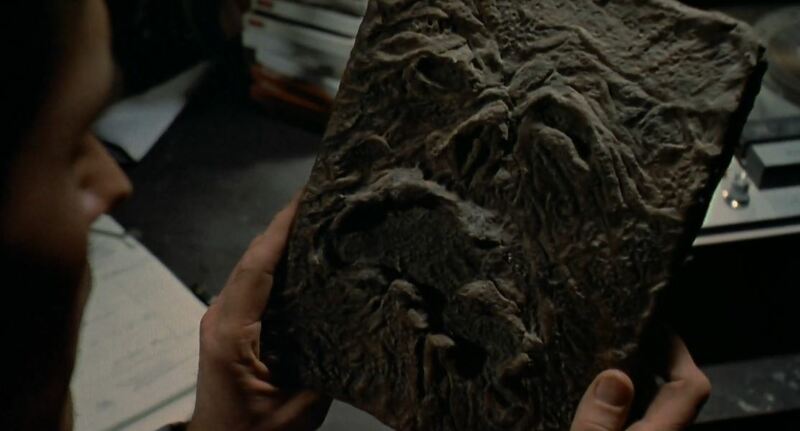 Necronomicon Ex Mortis. Roughly translated: Book Of The Dead. Last year, I spoke at length about how The Evil Dead (1979) changed me at a pivotal point of my teenage life. I didn’t know anything about the film, or really the horror genre at all at that point. And then it all changed. With an eerie buzzing of flies and a snaking of vines up a young woman’s legs, my outlook changed. It wasn’t long before I was actively hunting down everything I could find that could stand up against Sam Raimi’s debut feature. I remember someone showing me the poster for Army Of Darkness (1992) around this time. I could not believe what I was seeing. How can something look so different, and yet be part of the same franchise? It looked insane. At some point I asked my older brother if he had heard of these films and was stunned at his response. How have you not seen them already? He asked, incredulous. Within days he had posted me his Evil Dead trilogy dvd and I practically tore open the envelope to get my hands on what would quickly become my favourite film of all time. That film is Evil Dead II: Dead By Dawn (1987). There seems to be a bit of a tradition with the Evil Dead series. No film ever quite matches the beginning or end of the next in line. In a way, this is quite refreshing – as each movie (and now television series) can theoretically stand on its own to a certain degree. Take Evil Dead II, for example. 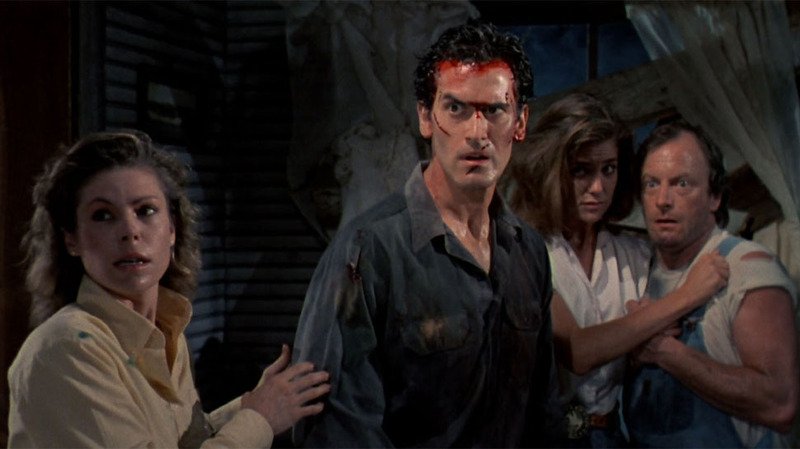 Opting not to be a straight forward continuation, Evil Dead II begins with an extremely condensed remake of the first film. Removing the group of college friends and replacing it with the story of a man heading up to a cabin in the woods with his girlfriend for a dirty weekend, and unleashing hell by mistake. 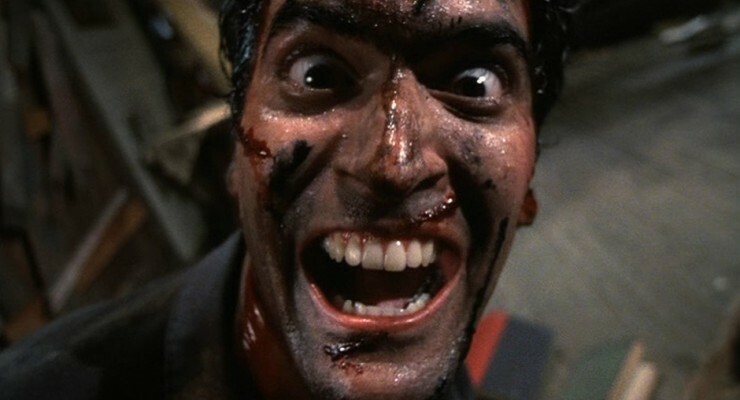 The man in question is, of course, Ash Williams (Bruce Campbell). Considerably more confident and charismatic, Ash sings and flirts with his girlfriend Linda (Denise Bixler) before she slips off into the bedroom. Distracted by a mysterious flesh-bound tome – the Necronomicon – and a tape recorder, Ash plays the device – broadcasting the ancient words into the woods around them. Raised from its dark slumber, the spirits of the dead rise once again – immediately attacking the cabin and abducting Linda through the window. Later, Linda returns – possessed. Ash fights her off, knocking the dead from her shoulders with a shovel and burying the body out in the woods. Later, Ash narrowly escapes his own possession and finds that the bridge to freedom has quite literally collapsed. 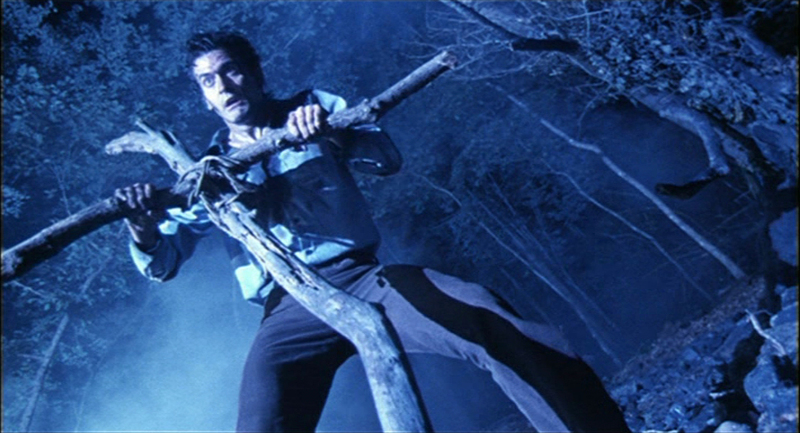 Stuck and alone, Ash returns to the cabin to spend a second night at the mercy of the evil dead. It quickly becomes clear that the spirits are toying with him, driving him to the point of madness. It only gets worse when, without warning, Linda’s severed head falls into his lap before biting down on his hand and refusing to let go. Reminding himself of the workshed, Ash places the head in a vice – before employing the use of a chainsaw to finish his thoroughly ex-girlfriend off for good. If there’s a word for demonic infection, or a sort of, sepsis from hell, then it can be used to what happens to Ash’s bite wound. Whatever it is, his hand quickly takes on a life of his own, and begins to attack Ash in possibly the most perfect example of physical comedy ever committed to film. Seriously. Bruce Campbell is a master. Sticking with the theme, Ash recovers long enough to employ the use of his chainsaw yet again – this time lopping off his hand at the wrist. The demonic forces continue their relentless taunting, virtually succeeding in driving our hero to the brink of insanity. At its peak, however, Ash is sharply brought back to reality with the arrival of Annie Knowby (Sarah Berry), her boyfriend Ed (Richard Domeier), and hillbillies Jake (Dan Hicks) and his girlfriend Bobby Joe (Kassie Wesley), who Annie picked up along the journey to the cabin. Confronted by the very evil Ash has tried so hard to survive, Annie and co. are slow to trust Ash, but in time they realise they are fighting a greater evil. Defending themselves against the evil forces in the woods, our heroes must seek the power of the Necronomicon to first make the demonic spirits corporeal, before banishing them to another plane. If only it were that easy. As the bodies pile up, the stakes grow ever larger, and eventually Ash is forced to arm himself against the raging spirits to banish them for good. That is to say, he replaces his lost hand WITH A CHAINSAW, carving down a double barrelled shotgun before standing before the final evil. Whatever happens next, one thing’s for sure – we know it’s gonna be groovy. 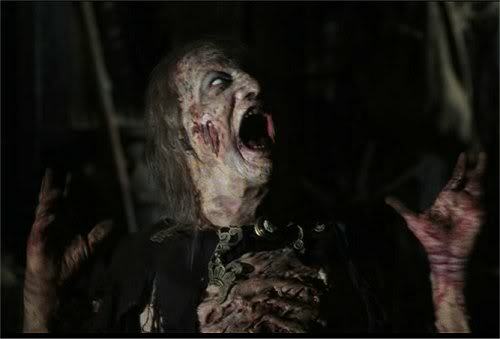 Evil Dead II is quite probably my favourite film of all time. Others may come and go, but I always come back to this one. The over the top style, the humour, the action – everything about it left me watching with wide-eyed glee the first time I saw it, and that sort of impression doesn’t wear off easily. A self confessed parody of the original Evil Dead, the sequel succeeds in being both a laugh out loud comedy and a well defined horror story. Its use of effects and clever camera work is on par with the original, though lacking in some of the more unusual camerawork. What it does have, however, is some seriously impressive special effects work. Make up aside, the level of blood and gore that were pumped into the set is truly staggering. While it would take me far longer can I care to admit to list out my favourite scenes, I would like to draw your attention to one particular favourite. Having just bisected his girlfriend’s severed head with a chainsaw while it first begged for freedom, then gloated at Linda’s soul being tormented in hell, Ash is notably concerned. Approaching a mirror to gain some perspective, he is abruptly grabbed by the throat by his reflection, who swiftly lays down the law. What grabs me about this is not only the effectiveness of the scene itself, but how it was achieved at all. Building a false wall with Bruce Campbell on one side, and a fake shemp with his back to us, it was a simple case of the stand in copying Bruce’s movements until the moment the mirror-Ash lunges forward. It’s pretty simple stuff, but done so effectively, it truly inspired me to think about how these tricks are done. Like poking my head through the magician’s curtain, Evil Dead truly made me sit up and pay attention to the art of filmmaking. Not many horror comedies can say that. You have a lot to answer for, Sam Raimi. I truly recommend this film – if you haven’t already guessed – but in case you’ve seen it before but haven’t dipped into the commentary tracks on the DVD/BluRay release, do. The commentary track for this film is possibly one of the funniest I’ve ever heard, and genuinely just sounds like a group of old mates getting together and watching a film they’ve seen a hundred times before. I guess they probably have, come to think of it.